The next morning we got up early and went to Versailles. 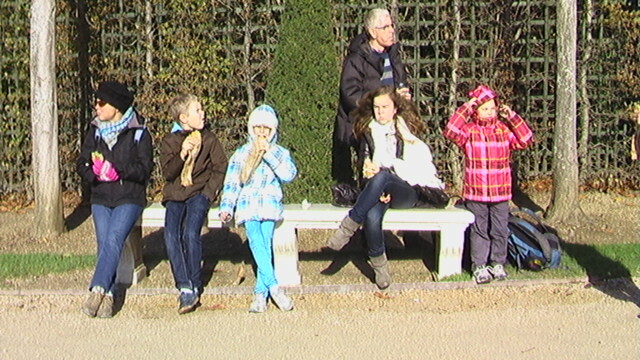 We had a long wait in line so the rest of us went to see the gardens while Gaelle and Mom held our place in line. Once inside we listened to the audio guide while walking through. The kids were able to wiggle their way in front and see the chapel and we saw portraits of the 3 Louis’s who lived there. We learned about French Garden which are not natural at all but instead of highly controlled. We saw the King’s bedroom and the Queen’s bedroom. I think that Isabelle was able to squirm her way to the front and get a picture of the door through which the Queen Marie-Antoinette escaped when the crowds came to get her. The highlight of the palace was the hall of mirrors and we saw that, too. One end is the war room and on the other end is the peace room. Louis 14th had a silver throne sitting at the entrance to the peace room but that throne had to be melted down when the government needed money. Then we went out to the gardens and were able to buy some sandwiches in the gardens and we ate sitting on a bench in the gardens. Because we wanted to be very safe, we did not risk going to the other parts of the gardens where there are other palaces, the Grand Trianon, Petit Trianon and the Queen’s village. Then we took the train back to Paris and, since we had extra time, we went to the Musée du Quai Branly, where there is art from Africa, Asia, Australia and the America’s. Pretty interesting, but not as much as the European art because we know so little about it. Then we took the long train trip back to Morlaix (4 hours) and got here a bit after 10 PM. This entry was posted in France, Unschooling and tagged castle, day 5, france, Paris, queens room, versallis by Chrissie. Bookmark the permalink. Loving the travelogue! Lousy weather but what a nice trip! Everyone looks like they are in fine form. When did Solenne get so tall? She’s taller than Gaelle now?? Looking forward to reading the rest of these — and seeing all the pictures! The girls really had a great time! They learned so much and loved visiting there Uncle, Aunt, cousins, and grandparents. 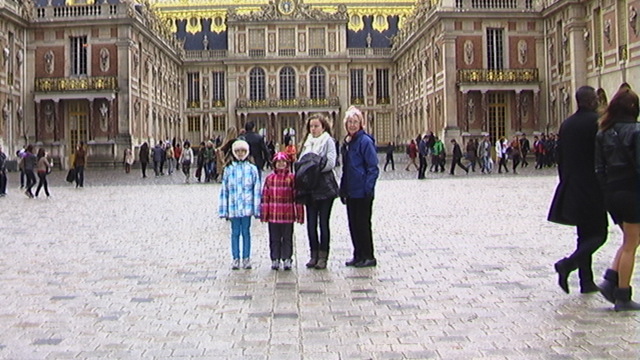 Isabelle favorite thing was seeing her cousins and McKenzey’s favorite was going to Paris and seeing Notre Dame. The girls want you to go with us next time…. That would be so much fun. By the way we need to send your bracelets, I will send you a message on Facebook.